You will receive over 25 carats of beautiful precious gems in many sizes and shapes. SHAPE: Mix. SIZE: Mix( 2mm to 5mm each ). CARAT RANGE: 0.25 ct. & Below. CUT: Faceted. Over 25 carats of loose faceted Sky Blue Topaz gemstones ---average grade quality gems. Size range 5mm to 10mm each. 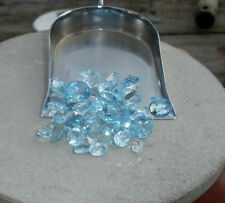 Sky Blue Topaz Gem Mix Lot. CUT: Faceted. You will receive over 25 carats from the pictured sample. CUT: Faceted. APPROX WEIGHT: Over 5 carats. SHAPE: Ovals and Pears. AVAILABLE AS: Precious Lot. COLOR: Multi Color. OVER 50 CARATS OF LOOSE FACETED NATURAL SEMIPRECIOUS GEMSTONES. CUT: Faceted. QUALITY OF THE GEM MIX RANGES FROM FLAWLESS TO EYE CLEAN TO HAVING INCLUSIONS. SHAPE: Mix. Semi-Precious Lot. COLOR: Multi Color. Photograph is A SAMPLE taken from exact parcel. Over 200 carats is shown in that photograph. OVER 200 CARATS OF LOOSE FACETED NATURAL GEMSTONES. The price for the over 200 carats will be. slightly included to visibly incuded . 50 carats full cut gemstones. Earth mined, Ready to mounting ! Non cabochons! Many buy from us to resale for profit. WHY BUY FROM US ?. Over 100 carats of loose faceted natural semiprecious gemstones. CUT: Faceted. SHAPE: Mix. Photograph is A SAMPLE taken from exact parcel. AVAILABLE AS: Semi-Precious Lot. COLOR: Multi Color. Each bag will contain many gorgeous and very highly polished tumbled gemstones. Over 100 different types of rough gemstones were used to make these tumbled polished gemstone mixes. 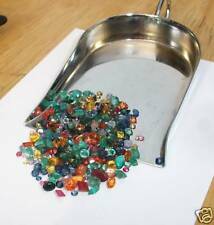 3000 Carat Lots of Size #7 Mixed Polished Tumbled Gemstones - Very Nice. Great 4 Rock Tumbler/Polisher COLORFUL Already Broken!! Mixed gemstones as photo. All natural. Very few lab created if there any. PRICE REDUCED. Lot #11 includes many, many cabochons and stones The photo will show samples of most of them. I have a list on pdf and Word, but it may not upload here. There are quantities of malachite cabs, black onyx, snowflake obsidian, adventurine, amazonite, bloodstone, blue onyx, crazy lace agate, tiger eye, and lots more. Each bag will contain many gorgeous and very highly polished tumbled gemstones. 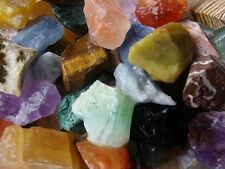 Over 100 different types of rough gemstones were used to make these tumbled polished gemstone mixes. 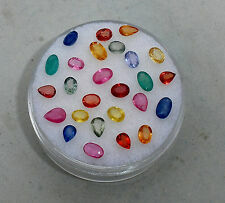 3000 Carat Lots of Size #5 Mixed Polished Tumbled Gemstones - Very Nice. PRICE REDUCED. Subject to prior sale. Yellow Citrine Gem Mix. You will rec eive over 25 carats from the sample photos. SHAPE: Mix. COLOR: Yellow. CUT: Faceted. SIZE: 0.50-8 ct.( 5mm to 16 mm ). APPROX WEIGHT: 25 ct. These are natural. 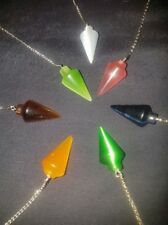 pendulum is unique and, therefore, coloration varies. These crystals are. These are natural crystals and may contain inclusions, internal fractures, or other small imperfections that do not effect the integrity of the crystal. Over 50 carats of loose natural rutilated quartz gemstones ---very nice quality gems. size range 14 mm to 20 mm each.you will receive at least 7 gems from the sample photos. Rutilated Quartz Gem Mix. A Brilliant Rainbow Color Mix. A Truly Great Opportunity To Buy Natural Faceted Gemstones. 500 Carat Total Weight Plus. Natural Mined Colored Gemstones. Eye Clean To Flawless,With Outstanding Luster. 2500 Carat Total Weight Plus. A Brilliant Rainbow Color Mix. A Truly Great Opportunity To Buy Natural Faceted Gemstones. Natural Mined Colored Gemstones. Eye Clean To Flawless,With Outstanding Luster. 100% Natural Earth Mined in Afghanistan. First picture shows one random 50 carat lot as a sample representative of what you will receive. Quantity is Limited. PRICE REDUCED. Subject to prior sale. 3 spaces are intentionally blank. PRICE REDUCED. Lot #5 is a very colorful variety of gems ready to be set or mounted by the professional or amateur. Many are in pairs for earrings. Gems include sky blue topaz, turquoise, peridot, genuine pearl, blue topaz and more. PRICE REDUCED. Lot #7 is a very special collection of gems, gemstones and cabochons. Many are in pairs for earrings. They will be appreciated by the professional jeweler. Subject to prior sale. 4 spaces are intentionally blank. CUT - Faceted. ALL GEMS ARE 100% NATURAL FOUND IN VARIOUS MINES ALL AROUND THE WORLD. 500 Carats. I also have available lots of. COLOR - Multi Color. GREAT AS A COLLECTIBLE. MAKE YOUR OWN JEWELRY. PRICE REDUCED. Subject to prior sale. 6 spaces are intentionally blank. These ARE NOT your run-of-the-mill tumbled & polished stones! The photos DO NOT do these little beauties justice! All of the stones are faceted and natural. Most stones originate from Brazil, Thailand & India. 100% Natural Earth Mined in Pakistan. First picture shows one random 50 carat lot as a sample representative of what you will receive. Quantity is Limited. Natural Quartz Crystal Pendulum. Clear quartz crystal is the universal stone it is a pure and powerful energy source. transmits and amplifies energy. Natural inclusions.each stone is different. Crystal from Brazil. PRICE REDUCED. These would be perfect for the professional jeweler or a beginner. In the lower left are a few porcelain or glass. Subject to prior sale. Pendulum is made of brass with silver plating. Each piece is unique and may differ slightly from picture. PRICE REDUCED. They are a variety of shapes and sizes. These were hand-picked for beauty and quality as well as uniqueness. Subject to prior sale. 252.4cts Full Gemcase W/ Rubies Sapphires Opals Tanzanite Grandidierite & More!! .9ct grandidierite. 1.7ct grandidierite. 2ct pink sapphires - uv reactive.7ct tanzanite. 252.4 carats total! Starting from the upper right & going down;. 1.4ct blue opal. 3.6ct lapis lazuli. 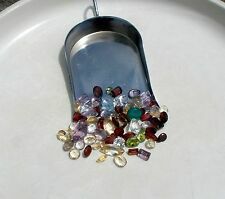 (M_005) ... 48.5 ct. Pudgie 5 ml Bottle 'O Faceted Mixed Gems - Stones to 12 mm! PRICE REDUCED. Lot #3 is a gorgeous selection of gems and gemstones just waiting for the right setting or mounting. These are for the professional jeweler or the amateur. There are even a few glass to use as practice. All semi-precious gemstone beads. Note: Beads will vary from listed size up to. 5mm in width and up to 1mm in length. Color Multi. Product Details. 3 mine rough (domagron)Medium Fossil Rough ---new with tag! mine rough (domagron)---bag of sand and gemstone---new with tag !